Quinctius picks up his 3rd knight automatically; 5 personal cash remaining. Normal vote tally up to 18. Aristocrats currently lead in total Influence, so activist knights will add another 9 votes. Family #20, the Terentians, activate. I thought the Sulpies might be the crappiest family of senators in the game, but I was wrong. So very, very wrong. So, if anyone wants a Mil 2, Ora 1, Inf 1 senator with shady loyalty, well, he’s currently cheaper than Sulpicius! Manlius spends his 5 cash on an automatic fourth knight. Since he isn’t in Rome, this doesn’t help the voting tally yet, but thanks to the Militarist abilities he does increase his Mil to 7! -- which could come in handy very soon! I’ll pause here in case Tripoli wants to try persuading the new senator, which he'd presumably try with Aelius, since one way or another he's got the best Influence, Oratory, and cash combo to work with. Relatedly, I haven’t gotten a clarification from Tripoli on Aelius’ cash distribution, as far as I recall -- either there’s 8 in Faction cash and Aelius has 10, or there’s 3 in Faction cash and Aelius has 15. Tripoli changed his plans somehow halfway through typing, one way or another, and typed both 10 and 15 cash for Aelius. This should be settled now before continuing! 25 to Aelius who donates it to the treasury for the influence. Another 15 to Aelius on general principles. And remainder (48-5-25-10=8) to faction cash. While your math is correct, I can't tell whether you want me to distribute 15 to Aelius or 10! -- if you want to donate 15, it'll be 3 cash left over. Whoops. 10 to Aelius. Sorry for the confusion. I'll process the Plutocrats next then, this afternoon. If anyone has designs on Terrance or Sulpy, drop me a line early, if you like! -- or for that matter, let me know if you won't be trying to persuade him either, so I'll know to move along. Acilius Sponsors level-3 Games, and Fulvius spends 5 of his cash buying his 3rd knight. Fulvius has 3 cash left over. Plutocrat vote tally goes up to 16. Acilius spends 18 cash, with 10 left over. His Popularity increases 3 to -2. Unrest decreases by 3 from 1 to 0 (the minimum). Malize’s Populists don’t have quite enough influence and Ora to feasibly try Persuading the new trash-level Senator, and he left me instructions (some of which I’ve already processed), so I’ll continue on... he rolls a 3+4=7, so that’s a Random Event: 1+2+3=6, which in the Early Republic means an Evil Omen! As the card notes, most dice rolls will now worsen by 1 until the start of the next Forum Phase. (Exceptions include the 3d6 roll for Random Events, and the 2d6 roll for whether a Player draws a Scenario or rolls a Random Event: that’s the “Initiative roll”.) The Republic’s Treasury instantly loses 20 Talents, down from 51 to 31! Moreover, the PontMax, Acilius of the Plutocrats, gets socked for 20 Talents to be paid from his personal cash! Since he only has 10, he loses that cash and also loses the PontMax Office!! Upon any senator losing that office, he also loses 5 Influence down to a minimum of 0, or in this case down from 11 to 6. The Plutocrat total Influence goes down 5 to 40. Thanks to the Omens, and being unable to deal with them, Acilius will immediately get a Major Suspicion marker. Since Acilius was unable to pay the full 20 Talents, his Faction must make up the difference -- plus an extra 10 Talents! But the Plutocrats only have 8 Talents remaining! 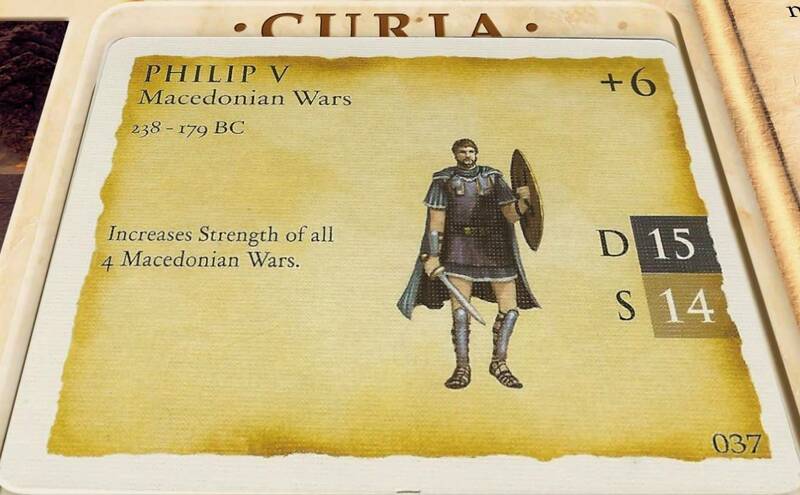 -- so not only do they lose that cash, the Faction Leader Claudius also immediately gains a Major Suspicion marker! But that isn’t all! -- any remaining Evil Omen cost must be immediately deducted from Rome’s cash! Fortunately this does not include the extra 10 Faction penalty, so the remainder will be 20 - 10 (paid by Acilius) - 8 (paid by the Plutocrat Faction Treasury) = 2 Talents. Rome’s cash goes down again from 31 to 29. Notice that one Evil Omen could theoretically wipe 40 Talents from the Treasury. In fact, if another one gets rolled, that’s exactly what will happen since there will be no PontMax yet (and his Faction) to try to offset half the costs involved to try to propitiate Rome’s gods: in Latin, to get them to lean toward Rome. In Greek the term is hilasmos, and roughly means to smile upon or be happy with them again. Meanwhile the new Fabian Statesman spends all 5 of his cash on his first minion, increasing the Populist vote tally to 26. Except wait! -- the Eeeeevil Omen makes that one notch less likely! He’d need 6 cash now to be certain of a knight! So in fact, Verrucosus loses his sacrificed 5 Talents, and does not gain a knight, and the vote tally remains 25. ...ohhhh, great, another one of the Successors: Antiochus the Third! He has started planning on a Syrian War, which you can expect to be upcoming now, and which basic strength he’ll increase by 5. Of course, he and/or Philip V might die of natural causes before then (during an Aging roll of the Population Phase), but guess what? -- the Eeeeeevil Omen makes that one notch less likely! More on that soon. This will end the Forum Phase, once I hear back from AzTank about whether he wants to try to Persuade the new Senator. 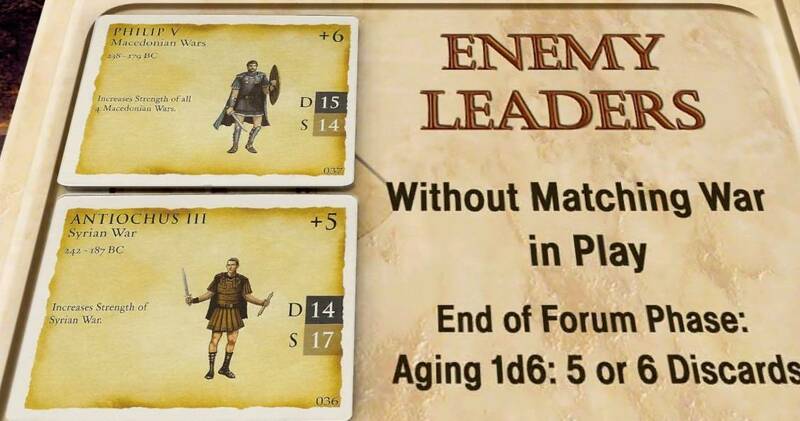 For that matter, Flaminius of the Progressives would have a maximal chance of it (9 or less on a 2d6, even with the Evil Omen knocking off a point, and even without spending any bribes! ), if AzTank doesn’t want to try. So I’ll pause to hear from both of them. To be fair, Cato of the Populists would have some chance at it, 3 or less on a 2d6, even though he has no cash to bribe with. So if AzTank decides to pass, or fails his attempt, Malize might as well try. I will attempt to persuade...do what I have to do to max my chance. Cato of the Populists donates his 10 to the Republic. Influence up 1 to 5; total Influence up to 19. Republic cash up 10 to 16. Plautius of the Progressives donates 20 to the Republic, 1 Influence to 3, total Influence 21. Republic cash up to 36. Aelius of the Militarists donates 25 to the Republic, up to 51 cash; up 2 Influence to 20, total Influence up to 24. Tripoli can clarify how much he's keeping and how much else goes to Aelius as we move along. I just caught this, republic cash should be 6+10+20+25=61. Also Aelius had 12 Influence, so 12 -> 14. Also also! The Republic had 107 talents, plus 10 from the above, -20 for Omens so it went down to 97. And then -2 to 95. Will double-check those immediately this afternoon! -- thanks! On Aelius, what happened was that a neuron was already focused on Manlius receiving a new minion, so I upped his influence by 2 instead of Aelius. Manlius should have 18, and Aelius should now have 14. Also, I keep forgetting that total influence isn't affected by whether or not a senator is in Rome. Votes are affected -- Manlius' new minion can't help vote any more than any of his other knights. So the Militarist total Influence is 42 (18 for Manlius + 14 for Aelius + 10 for Julius). But current voting power is 12 (Julius 3 Ora + 5 knights; and Aeilius 4 Ora). The Republic income glitch came about because I was just sure I could add 25 to 36 by myself, sigh.... and so I forgot to carry a 1 or something and ended up 10 short. Worse, when I was figuring out the Omen penalty I not only used the 51 instead of 61 figure, I shouldn't have been using 51 at all!! -- I had completely somehow overlooked the 3rd income segment, and the cash picked up at that time! Current tally is indeed 117 -20 -2 = 95. 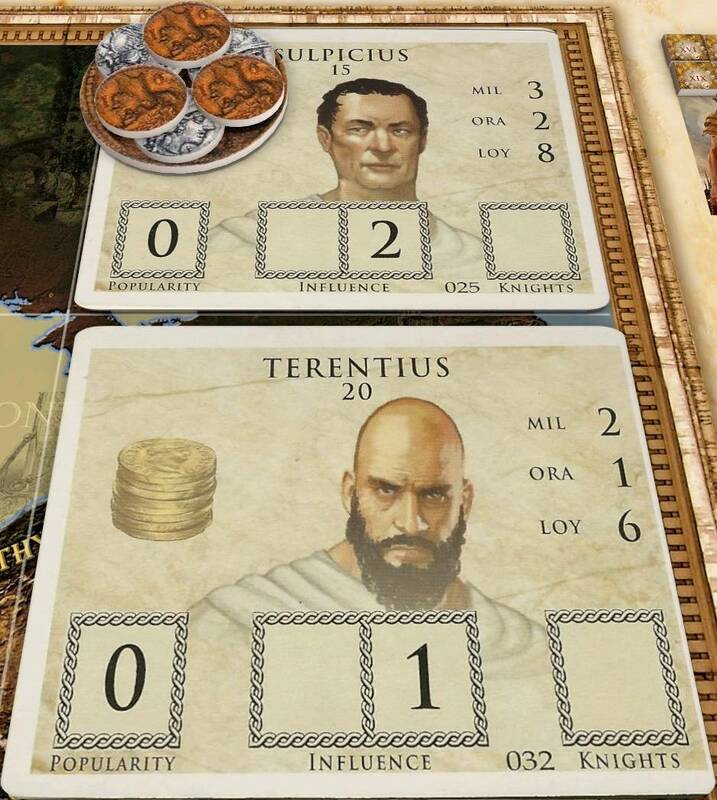 ...I genuinely believe my math has been getting noticeably worse..
Having fixed (and saved) that: AzTank instructs Furius (his Faction Leader) to try Persuading Terentius. I'll pause here to allow counterbribes from Faction Treasuries. Only I.I. 's Aristocrats, and Tripoli's Militarists, have any Faction cash to counterbribe with, 10 and 8 respectively. Furius has no more personal cash to add to the bribery attempt. On the other hand, if AzTank fails, Terence will have 3 extra cash, which will scotch Cato's chances completely. So at this point, with AzTank having confirmed he's going to try, and that he'll pay to maximize his chances, it's a moot point: Cato has no chance one way or another. Sorry. I have at least one reason not to continue with the Persuasion roll yet, so I'll have to wait until tomorrow afternoon. Maybe early afternoon, though, since I'm planning to let the crew off early for the weekend as a reward for them finishing this week in powering through a heavy work schedule before and after (and somewhat during) the holidays.